Heart rate after workout can tell a lot about your heart health. Know what's normal and what's not here. And learn to work out at targeted heart rate. Heart rate and exercise have a very strong connection. For example when you are exercising, the heart rate goes up. When you stop exercising, the heart rate goes down and recovers after two minutes. The rate again goes down as you get more fit. Every individual has different heart rate, so the actual number can vary. People with similar physique and fitness level can have different heart rates. In some individuals, heart rate after exercise remains high with irregular electrical pulses which can be a signal to several health issues. To assess whether your heart rate is normal or require treatment, you will want to know the details below. According to health specialists, 60-85% of maximum heart rate is considered normal after exercise. The max heart rate is the result you get with 220 beats per min subtracting your age. So if you are age 30, your maximum heart rate is 190 beats per min, and the normal exercise heart rate should be in between 114 and 162 beats per minute. If your heart is fit, the heart rate after workout will recover rapidly; however, the recovery process may decline after you entering 40s. Check your heart rate as soon as you stop exercising and then recheck after a minute, if the rate declines fewer than 12 beats per min, then the slow recovery can be an indication of a bad heart health. In all such cases, consult your doctor for advice. A study conducted by Cleveland Clinic Foundation showed that individuals in whom heartbeat reduces fewer by 12 beats/minute just one minute after exercise have greater probability of dying before 6 years than others. Stress tests are used by doctor to know the functional health of heart during workout. A blood pressure cuff and electrocardiograph are used to notice the effects of exercise on blood pressure in this test, heart rate and electrical activity are also examined. If conducted properly, the test can tell about the conditions like blocked arteries which don't appear on normal heart rate. It is also reported that if heart rate after exercise returns slowly to its normal rate, then there can be greater risk of having abdominal obesity, cholesterol problem, diabetes and cardiovascular problems. If you find your heart rate is abnormal after exercising, there is target heart rate that people can try to achieve. 1. What Is Your Target Heart Rate? Along with the target heart rate, there are 2 related concepts you should know—maximum heart rate and resting heart rate. 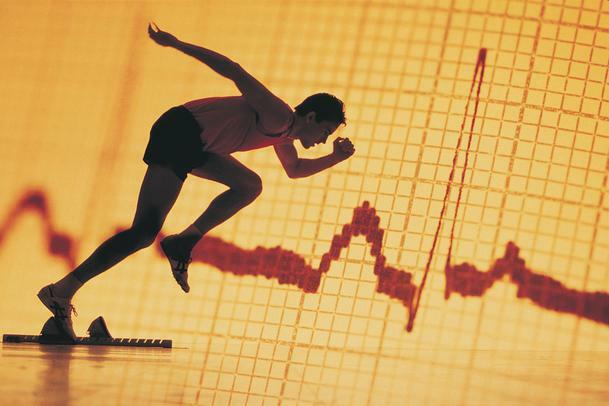 Maximum heart rate estimates the heart rate that an individual can achieve during exercise. This is not a figure that you should achieve. Resting heart rate refers to the heart beat rate when we are at rest. It is best measured in morning when you've no stress, movements or caffeine. Target heart rate: Maximum heart beat rate percentage should be kept under a particular range therefore to enjoy the benefits during workout, according to your exercise goals and conditioning level. You will need to do some arithmetic to figure out your targeted heart rate to achieve in exercise. After this calculation, the person can maintain the target heart beat rate in between 117 and 157bpm to reach 60-80% of max heart rate during workout, which is safe and beneficial. Calculating from this formula, the person will be able to maintain target heart rate inbetween 140 and 170bpm to reach 60-80% of max heart rate during workout. Two different formulas give different ranges. Why? Because formula 2 is adjusted for the resting heart rate, which is more accurate for continuous and regular exercise. So, if you plan for a longtime exercise program, you can take the second formula. If you can occasionally check your heart beat during exercise, then formula 1 is much easier to do. Keep it in mind that the max heart rate is just for guidance and slightly higher or lower range isn't dangerous at all. You may discuss your targeted heart rate with your physical trainer or physiologist. According to a research, interval training of 60 to 90 seconds with relatively higher intensity scattering through the whole process is reported to be well-tolerated, even for those who have serious cardiac problems. The training also effectively increases cardiovascular fitness. Some medications can reduce the max heart rate; therefore the targeted rate needs to be reduced as well. You can ask your doctor if you need a lower target beat zone due to any medical conditions or medications you're using. The time to reach target heart rate after exercise depends on the conditions completely. Heart rate usually increases rapidly if you are not of condition. But if you are in good health, it will take more time to increase. You may need to overwork if your heart rate is naturally low and if it is naturally high, you can enter into the zone with much lesser hard work.